How can I view ICICI Bank Home Loan Statement? â€¢	Firstly go to the official website of the ICICI Bank. â€¢	On this page, click on the personal banking and then click on the loan and then click on the home loan option. â€¢	You will refer to a new page, click on the â€œHome Loan Statementâ€� option. â€¢	This is the page, you can see the state man by inserting your Home Loan Account Number, Date of Birth, Account Number, Loan Amount, EMI Amount and then click on the submit option. 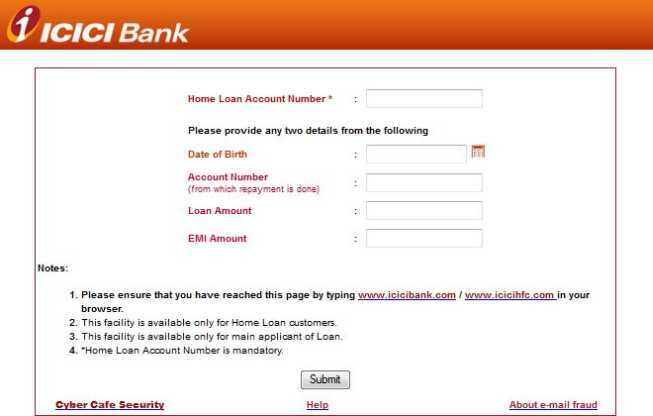 Ans: You want to see ICICI Bank Home Loan Statement so for this I am providing you link of a file where you have to fill a form by enter Home Loan Account Number, Date of Birth, Account Number, Loan Amount, EMI account and then by click on submit button. Following image is of ICICI Bank Home Loan Statement View Webpage. This facility is available only for Home Loan customers. This facility is available only for main applicant of Loan. Home Loan Account Number is mandatory. The loan must terminate before or at 65 years of age or age of retirement, whichever is earlier. I want Home loan statement from start to end. can you please advice me how can i get the statement of the same. baghirenga@rediffmail.com. I want complete statement. MY HOME LOAN ACCOUNT NUMBER IS Lbjod00001885485. I WANT MY HOME LOAN STATEMENT TILL NOW . SO KINDLE ARRANGE MY FULL TRACK MEANS TOTAL WITHDROWN EMI AND PENDING LOAN AMOUT. pl. view my home loan account. MY HOME LOAN ACCOUNT NUMBER IS LBPUN00001975010.